LEXINGTON, Ky. (AP) — Keldon Johnson had a big night for No. 10 Kentucky but was more concerned about the bottom line. Johnson scored a career-high 27 points to lead the Wildcats to a 77-62 win over Tennessee State on Friday night. Kentucky coach John Calipari was pleased to see the freshman guard produce and finish underneath. 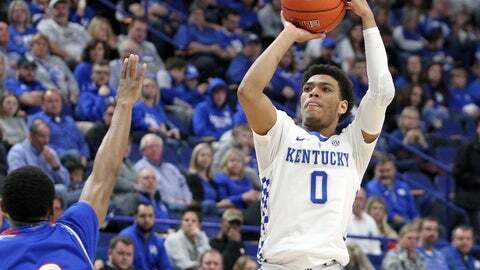 “He was seeing gaps and he was seeing opportunities to go at the basket and was strong at the rim and did a pretty good job,” Calipari said. The Wildcats (5-1) finished 4-0 in the Ohio Valley Hardwood Showcase and won their fifth straight since a season-opening blowout loss to Duke. Kentucky concluded a span of three games in six days by notching its 48th consecutive victory over a nonconference opponent at home. Six games into the season, Calipari said the Wildcats are a “ways away” from becoming a dominant team, especially on defense. Johnson scored 20 points in the second half as the Wildcats pulled away. Johnson made 13 of 18 free throws and finished with seven rebounds. Reid Travis added 13 points and nine rebounds. Donte Fitzpatrick-Dorsey led the Tigers (2-4) with 18 points, followed by Emmanuel Egbuta with 13 and Kamar McKnight with 10. Kentucky sophomore PJ Washington, who scored 62 points combined in the previous three games, finished with just six points. Kentucky missed its first eight 3-point attempts before Immanuel Quickley and Tyler Herro connected on back-to-back 3s to give the Wildcats a 15-14 lead. That sparked an 11-0 run. Kentucky continued to struggle from the field in the first half and made just 9 of 27 shots. The Wildcats made 16 free throws on 20 attempts to build a 35-27 lead at the break. Only one Kentucky player — Herro — made more than one field-goal attempt. Overall, Kentucky made 27 of 41 free throws. Kentucky: The Wildcats had surrendered 29 3-pointers in their two previous games but limited the Tigers to just six from long range. The Wildcats, who have out-rebounded their opponents by an average of 18.8 per game, dominated the glass, 37-28. Tennessee State: The Tigers fell to 0-5 all-time against the Wildcats and haven’t beaten a Power Five school since a 64-63 win over South Carolina in 2011. The Tigers play at Memphis on Dec. 22 and at Vanderbilt on Dec. 29 before opening Ohio Valley Conference play against Tennessee Tech on Jan. 3 in Nashville. Kentucky: The Wildcats could benefit from Auburn’s loss to Duke in the Maui Invitational earlier this week. Kentucky is one of four Southeastern Conference schools ranked in the AP Top 25. Three of those teams — Tennessee, Kentucky and Auburn — are in the Top 10. Kentucky should remain in the Top 10 when the rankings are released Monday. Tennessee State is at Western Kentucky on Dec. 1. Kentucky hosts Monmouth on Wednesday night.